A couple of weeks, I tried the Uwagimaya in the International District and was successful in my quest for Yuzu juice. I also purchased a jar of yuzu marmalade, just as a back up. On my first attempt, I used the Yuzu juice in my cake. I reduced the juice a little bit to make it more concentrated and used it to replace the milk in the cake recipe. When I tasted the batter, it didn’t seem overly strong, so I added a little more. As the cupcakes baked the flavor must have intensified as when I tasted the baked cake, it was extremely tart…almost like a sour candy. I think the acidity adversely affected the crumb of the cake as well as the resulting texture was very grainy, almost like a cornbread. I was hoping to balance out the flavor with a sweet icing and I attempted my vanilla soymilk “gravy” icing, but was unsuccessful. I hadn’t baked in awhile and the icing didn’t turn out very good. It was runny and grainy. I ended up taking the cakes to work with no icing and left a container of the runny icing goo nearby for people to ice their own. When I was complaining about the sourness of yuzu, one of my managers suggested that Salted Caramel would make a nice contrast to the tart fruit. I found a cooking website that suggested sweet or salty flavors would help balance out overly sour tastes, so I decided to use her suggestion. 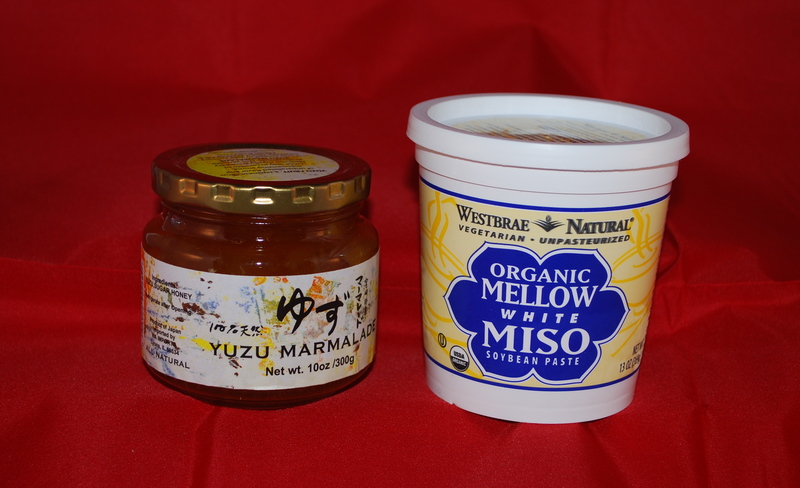 I wanted to keep with the Asian feel and thought that Miso would provide an interesting salty flavor to the caramel. On my second attempt at Yuzu cake, I used the yuzu marmalade instead of the yuzu juice. The resulting cake had a mild citrusy grapefruit-like flavor, which was intensified when actually biting into one of the pieces of yuzu zest from the marmalade. The texture was light and not at all granular. I made a caramel and added a couple of tablespoonfuls of white miso after it was complete. After it had cooled, I added some to an Italian meringue butter cream. The miso flavor was very light but distinctive. I thought the flavors went well together. Yuzu Miso= YUM. I have a new project! A new alphabet! 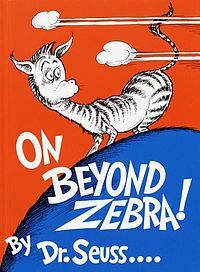 One of the doctors at the clinic where I work occasionally suggested that I create cupcakes based on Dr Seuss’s book On Beyond Zebra. I thought that was a brilliant idea, so thanks to Dr Chris Vincent! I have some ideas for each letter, but suggestions are welcome. There’s currently a poll for WUM up on The Cupcake Addict’s Facebook page. One of my resolutions for 2013 is to be more productive. So far, I’ve attempted to bake and it’s only the 6th. YAY, me! A couple of months ago, I picked up a bag of smoked chocolate chips from Hot Cakes Molten Chocolate Cakery in Ballard. I’ve had it in my mind to redo a S’mores Cupcake using the chips and finally got around to trying it today. I realize that a S’more isn’t smoked…The chocolate just reminded me of a campfire. 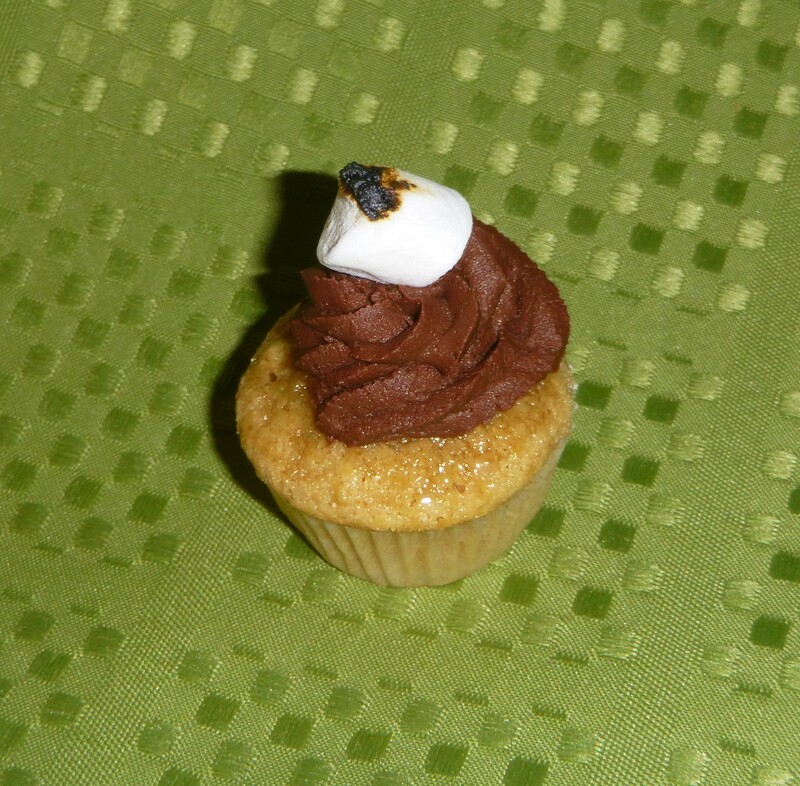 I also wanted to get the impression of a S’more without reproducing a Trophy Cupcake. (I also need a new pastry torch…so I can’t toast the tops without holding them under the broiler.) My plan was to make a graham cracker cake, fill it with marshmallow fluff and top it with whipped chocolate ganache that I made from the smoked chocolate. I thought that this would be the right order…graham cracker on the bottom, chocolate on the top, liquid-y marshmallow to squirt out from the middle to get your fingers all sticky…all with the faint hint of smoke in the back ground. 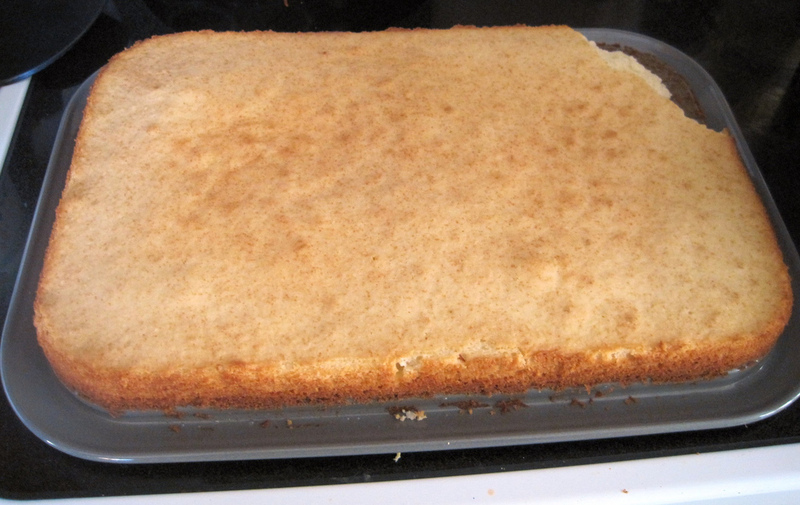 When I try this again later in the week, I will go for the graham cracker pound cake…The cake ended up overly fluffy…a result of 1 tablespoonful of baking powder AND 3 stiffly beaten egg whites. I should have known. 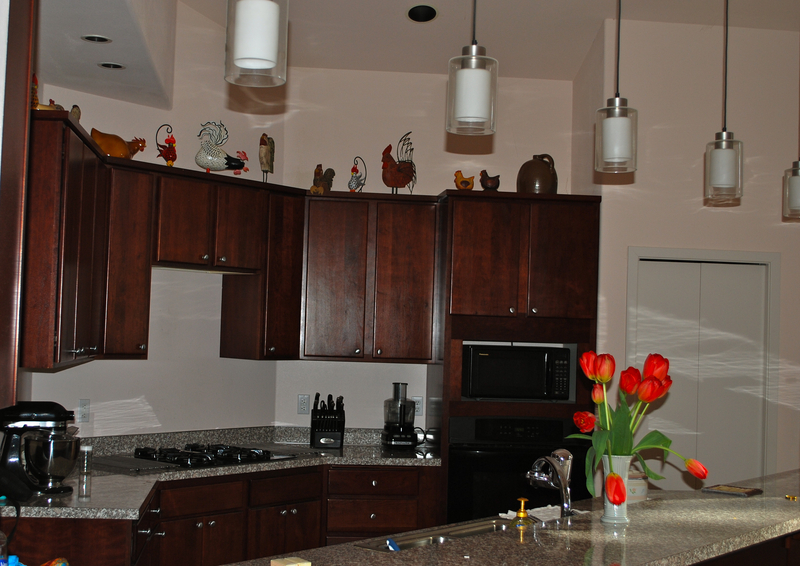 First, I have to say that I LOVE my new kitchen! It’s quite a change from my previous kitchen, as seen here . It was definitely easier to bake in the new kitchen. Mr Shuck could actually come into the kitchen with me. I didn’t have every available counter space covered in baking stuff. An added bonus: all of my stuff fits in the kitchen, so no trips up and down the basement stairs retrieving supplies. So, I’ve been wanting to attempt a naturally tinted Red Velvet cake since I first started baking. 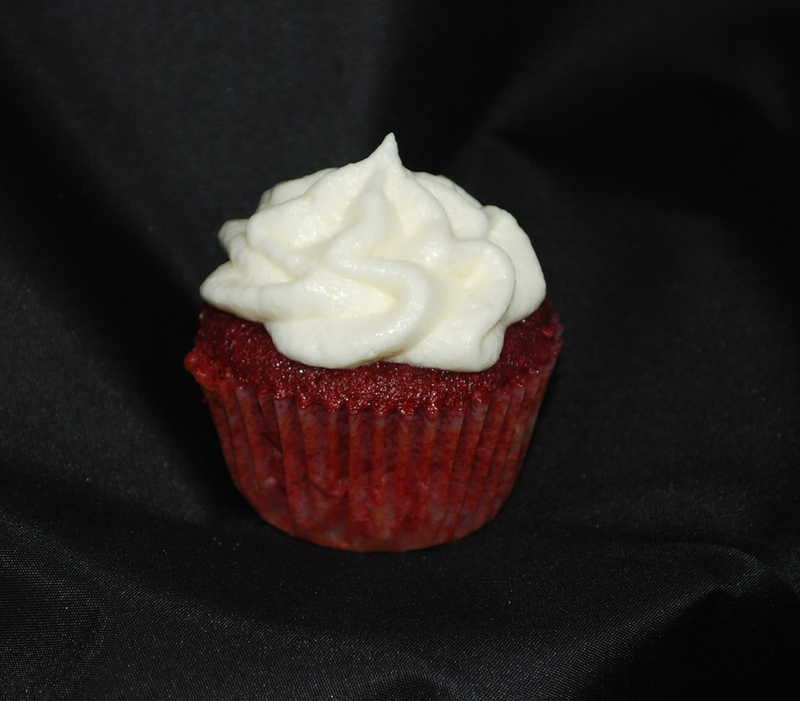 I have never enjoyed Red Velvet because I’ve always felt like I could taste the red dye. Maybe it was all in my head. I would like to say that I figured this all out for myself, but I wasn’t willing to invest that sort of time for my first baking project in months. Fortunately, Jamie over at Sophistimom had already done the research for me. For the most part, I followed her recipe, but made a few minor changes: Someone who commented on her post recommended using buttermilk instead of cream cheese, which I did. Many of the comments were that the cake was very dense and I was hoping for something lighter. I thought that swapping out a liquid for a semi solid would help with that. Buttermilk is also pretty acidic, so I thought that would help keep the beets bright. 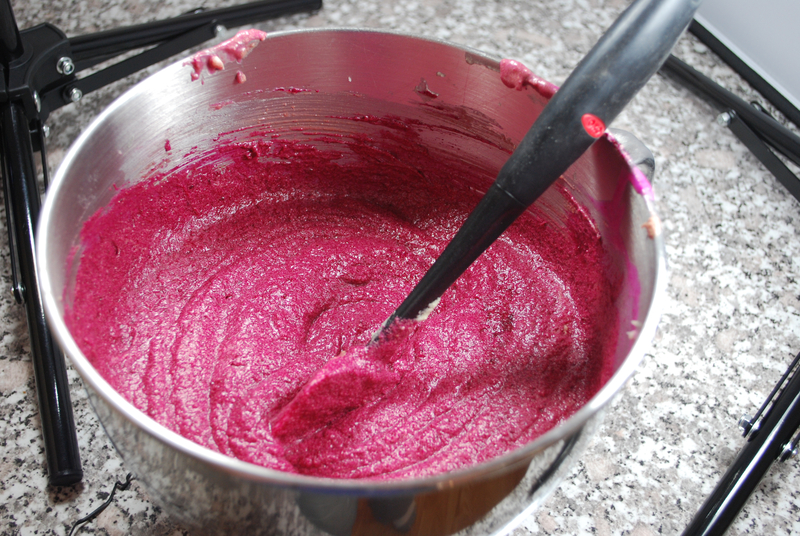 I also ended up with only 1 cup of beet puree from my bunch of beets. 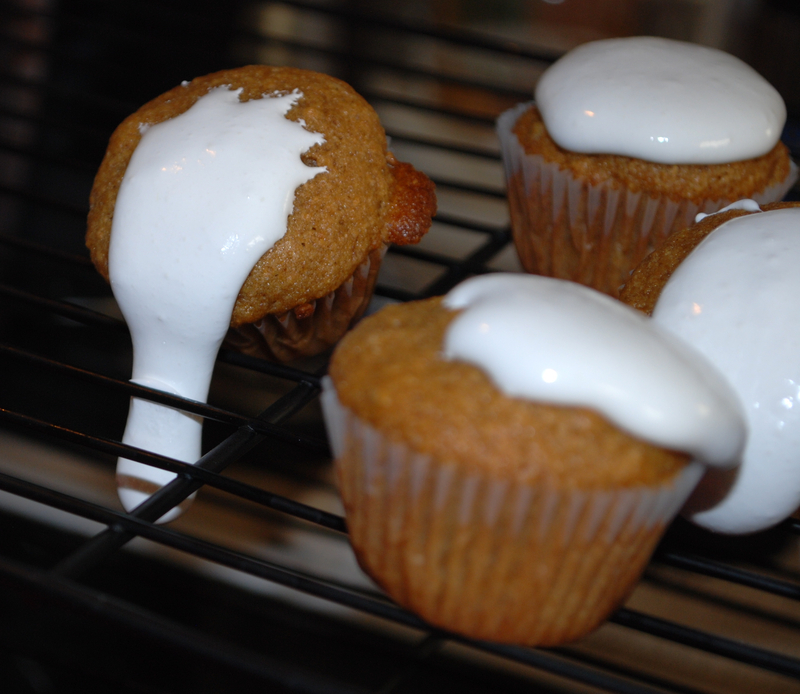 I did not use her cream cheese icing recipe. Traditional Southern Red Velvet cake is topped with a light and fluffy icing that’s made with a base of cooked flour and milk (like gravy) that’s mixed into whipped butter and sugar. 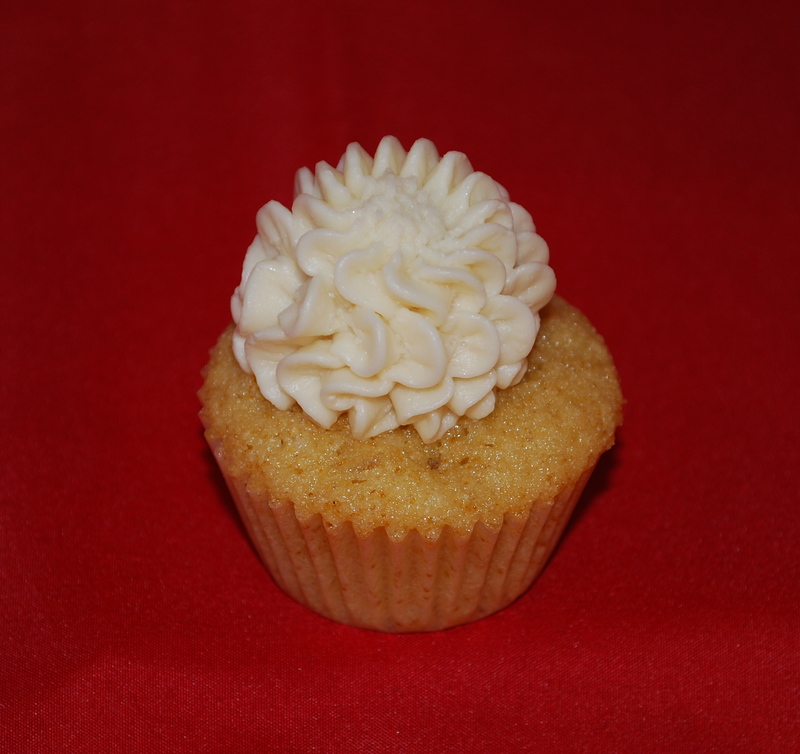 I first used it to make a lighter cream cheese icing here and later in my Caramel Popcorn cupcakes. Sophistimom’s recipe instructed me to “Preheat oven to 350 degrees (165 degrees celsius). Place beets in a small baking dish and add a 1/2 cup of water. Cover with parchment paper and foil, and roast until quite tender, about 60-90 minutes. Allow to cool completely.” I didn’t want to wait around the house for an hour or two, so I wrapped the beets in some foil, dumped them into a mini crock pot, and went furniture shopping for 4-5 hours. When we returned the beets were very tender. After the beets cooled, I chopped them up and put them in the blender with the lemon juice and vinegar and pureed until smooth. 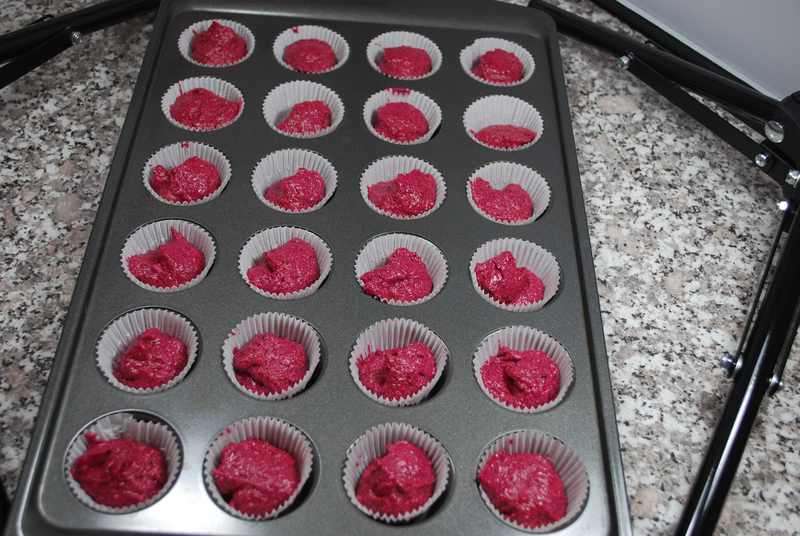 Next, I preheated the oven and started setting out liners in mini cupcake pans. While the oven preheated, I creamed together the butter and sugar using the paddle attachment on my Kitchen Aid. After it was nice and fluffy, I added the eggs one at a time. While the wet mixture was going, I mixed together the flour, baking powder, salt and cocoa. I also poured the buttermilk in the messy blender (after removing the beets) and ran it for a few seconds to get more of the beet pulp out of the blender. I alternated adding the dry ingredients to the mixer bowl with the now bright pink buttermilk. After this was mixed thoroughly, I added the beet pulp and mixed by hand until uniform. I added the batter to the tins using a little scoop. Initially, I filled them up only 2/3 full as I didn’t know how much they would rise. I unwrapped all of the short ones and have thrown them into the freezer. I’ll make cake pops out of them one day soon. I’m not really familiar with my oven yet. I thought I set the timer for 15 minutes, but apparently didn’t. 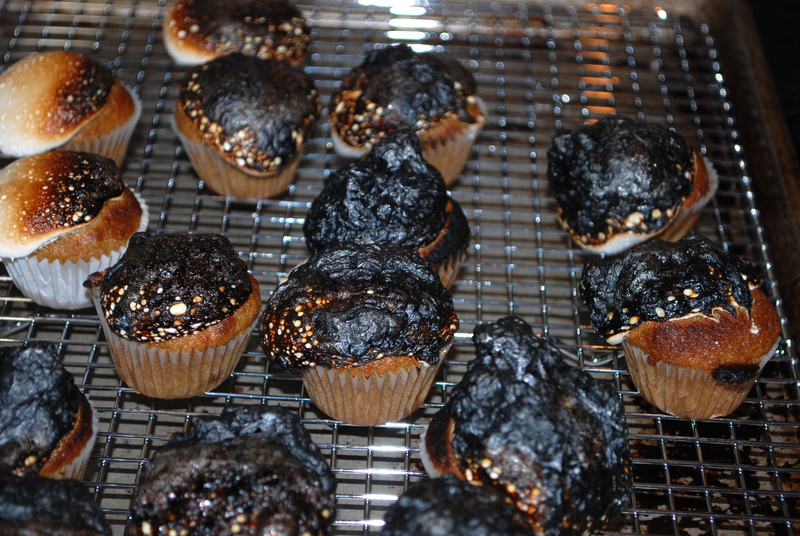 I think they baked for about 15 minutes or until the tops sprang back when poked with my finger. 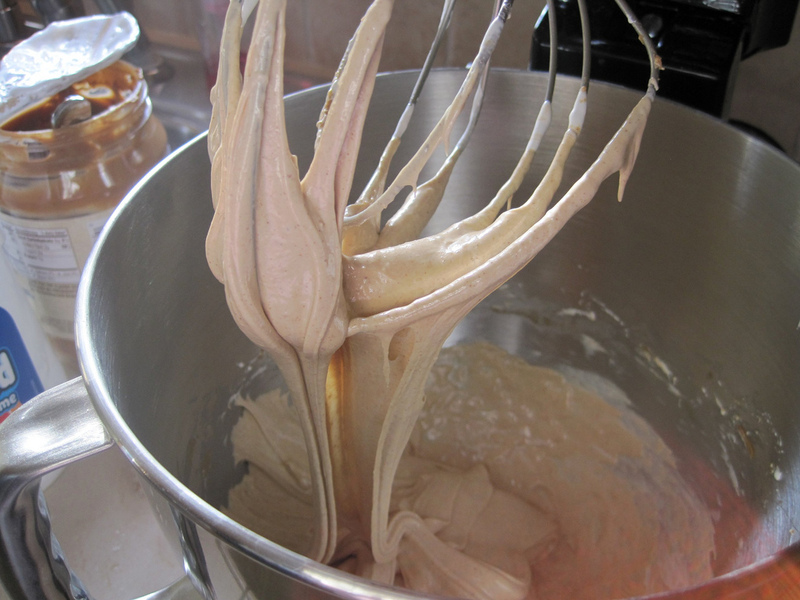 Mix the flour and milk in a saucepan with a whisk until flour is dissolved. Heat over medium high heat until mixture thickens (about 10-15 minutes). Remove from heat and pour into a bowl, cover with waxed paper (or plastic that doesn’t melt) and allow to cool to room temperature, then cool in refrigerator. Beat the butter well until fluffy using the whisk attachment. 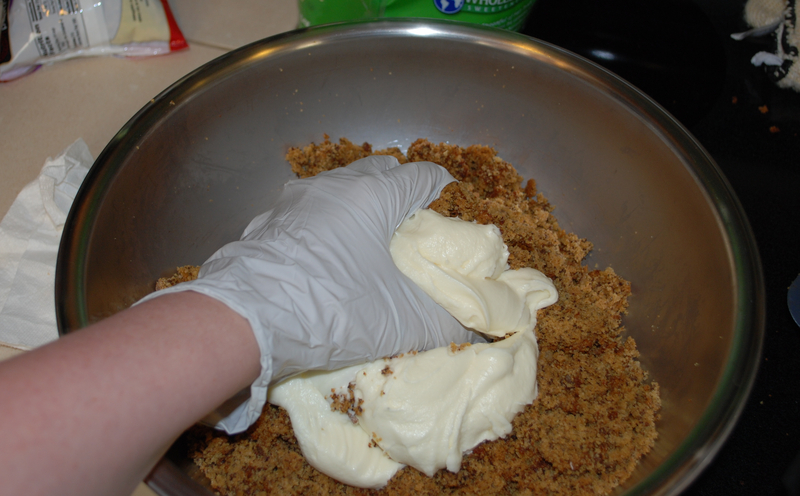 (I actually ended up adding about 1/2 of a container of whipped cream cheese…to get it out of the frig). Add the sugar and beat on medium high speed for 6 minutes (or until white and fluffy and sugar is dissolved). Add the cooled “gravy” to the butter mixture and whip until well combined and fluffy. I’ll be distributing these at work on Monday and hope to provide feedback afterwards. I’m pretty happy with the way they turned out, especially since I haven’t baked in a LOONG time. Thanks again to Sophistimom for all of her work! The cake turned out really moist and fluffy. 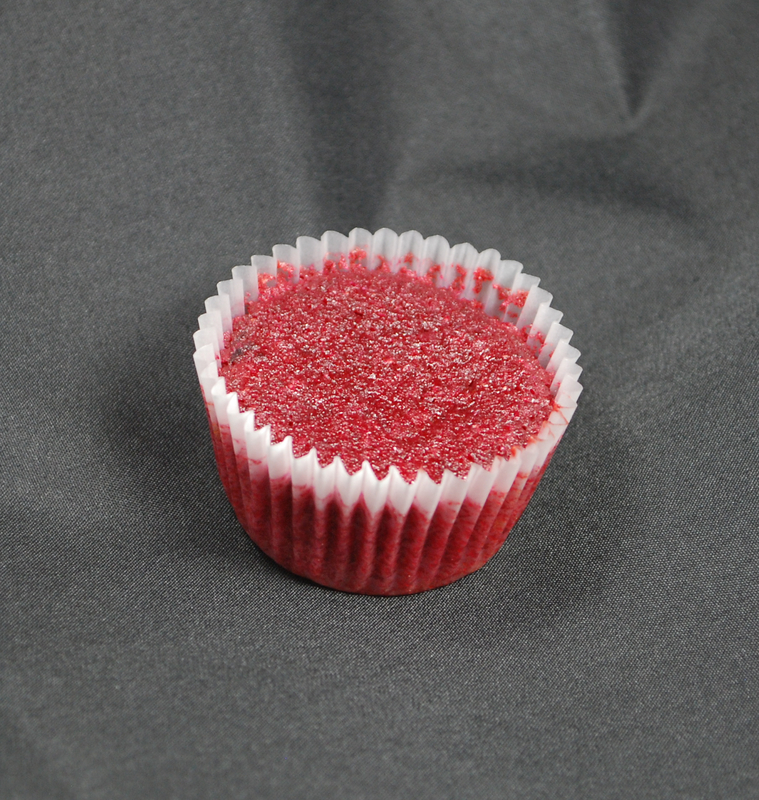 Without the icing, it has a slight “earthy” taste from the beets, but is still very good and definitely very colorful. I’m not sure if it’s red, purple or magenta, but it’s pretty! So…the new kitchen is unpacked. The rest of the house…not so much. I have a recipe picked out to hopefully bake this weekend. It seems like Z has recently been for ZERO cupcakes in production. Today Z is for Zero candy bar. Hershey’s website describes the Zero bar as a “unique combination of caramel, peanut and almond nougat covered in delicious white fudge”. The ingredient list is a bit longer: SUGAR; CORN SYRUP; VEGETABLE OIL (PALM KERNEL AND PALM OIL); NONFAT MILK; SOY PIECES; PEANUTS; CONTAINS 2% OR LESS OF: COCOA; MALTED MILK (BARLEY MALT EXTRACT; WHEAT FLOUR; MILK; SALT; SODIUM BICARBONATE ); PEANUTS; ALMONDS (ROASTED IN COCOA BUTTER AND/OR SUNFLOWER OIL); SALT; ARTIFICIAL COLOR; SORBITAN TRISTEARATE; EGG WHITES; SOY LECITHIN; HYDROLYZED SOY PROTEIN; ARTIFICIAL FLAVOR; MONO- AND DIGLYCERIDES . I love me some glycerides. YUM! It’s been decades since I had a Zero bar, so I thought I’d refresh myself on the flavor. Not as easy as you might think. Mr Shuck finally found one for me at a Rite Aid. I must say that it really wasn’t worth all the time it took to find. The flavor was what you’d expect from the ingredient list above. It was a little waxy and very sweet. I thought these had whole almonds on top…apparently at one time they did, when they were produced by the Hollywood Candy Company. Now that they are produced by Hershey’s, they seem to just have some almond crumbs mixed in with the nougat. After looking at the ingredient list (which I did after making the cake balls), I wished that I had known about the malted milk soon enough to incorporate that into this somewhere. Oh, well! 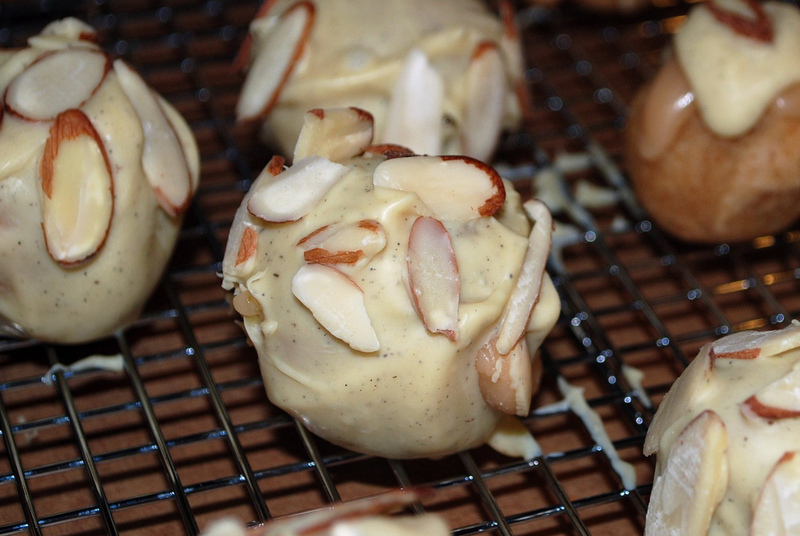 The cake ball started with an almond cake recipe that I found on the Odense website. I had a tube of marzipan lying around and wanted to use it for something. The cake recipe called for almond paste, not marzipan, so I adjusted it a little. Marzipan has a lower percentage of almonds (28%) than almond paste (45%) so contains more sugar. I also knew that my nougat frosting was going to be incredibly sweet, so I wanted to use a bit less sugar. The only pan that I haven’t packed up was a rectangular spring form, so I used that instead of a tube pan and reduced the baking time. I replaced some of the flour with almond meal as well. Preheat oven to 325 degrees and grease the pan. Put the marzipan in the food processor with sugar and 1/2 of the almond meal and pulse. Add the eggs and pulse until combined. In a separate bowl, combine the flour and baking powder. Transfer the mixture from the food processor into a large bowl and add half of the flour mixture. Stir just until combined, then add milk. Stir just until combined, then add the rest of the flour. Bake for around 30-35 minutes or until golden brown and top bounces back when pressed. Allow to cool for around 10 minutes in pan, then un-mold. I found a recipe for nougat icing at FoodTV.com and altered it only slightly by using 1/2 almond butter and 1/2 peanut butter. I bought smooth butters and decided that crunchy would be better, so I smashed up some sliced almonds and added them in also. Combine 1 large (16 oz) jar of marshmallow creme or fluff with 1/8 cup peanut butter and 1/8 cup almond butter and beat with electric mixer until combined. Mix in about 1/4 cup crushed almonds. While the cake balls were solidifying in the freezer, I attempted to make caramel. I have made caramel a few times before using sugar, water, cream and butter, but I saw a recipe that called for sweetened condensed milk which said it was faster. 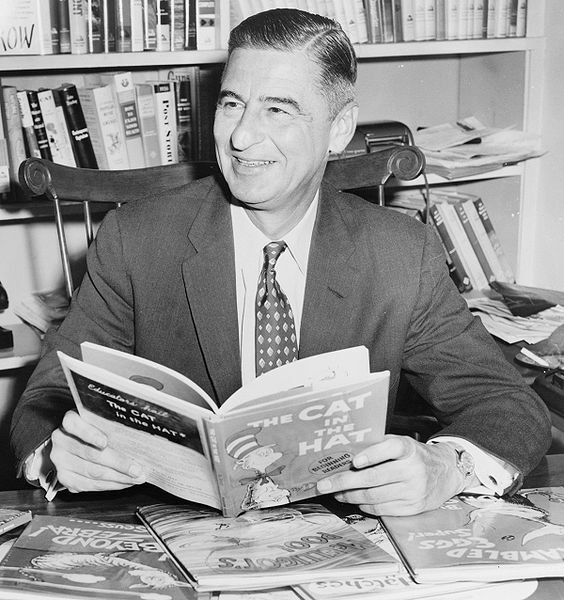 I should always do what I know…. A couple of days later when I had another day off, I made caramel candy using the recipe I was used to. I combined 3 tablespoons water with 1/4 cup corn syrup and 1 cup of sugar in a pan over medium heat. While I was bringing it to a boil, I warmed 3/4 cup cream and 1/4 cup butter in the microwave. When the sugar mixture reached 320 degrees, I slowly added the cream mixture. You have to be really careful with this as the mixture will SERIOUSLY bubble over. I returned the mixture to 240 degrees, then removed it from heat and put the pan in a bowl of water to cool it off a bit. I think my thermometer may be a bit off as the sugar syrup was a bit too light when I added the cream. I put the caramel covered balls back into the freezer (as there is no room in my frig) while I melted some white chocolate bars for the coating. 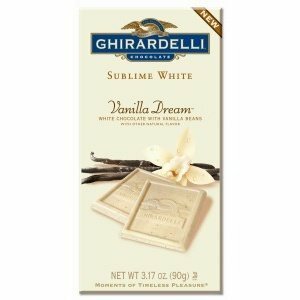 I chose to use commercial white chocolate bars because I thought straight white chocolate would be too soft for coating. Before you read this, I have to warn you that this is going to be sticky…. Sweet Potato Casserole stolen from Southern Living. I have never liked Sweet Potato casserole…mainly because I don’t like yellow sweet potatoes or yams. (Unless they they are made into french fries.) Before we moved to Washington, I wasn’t even aware that there were white sweet potatoes, which I don’t mind, but don’t crave. Back to the topic: My family always had Sweet Potato casserole at Thanksgiving and Christmas. Mr Shuck says that it was more like a dessert anyway, with the brown sugar and nuts and marshmallows. 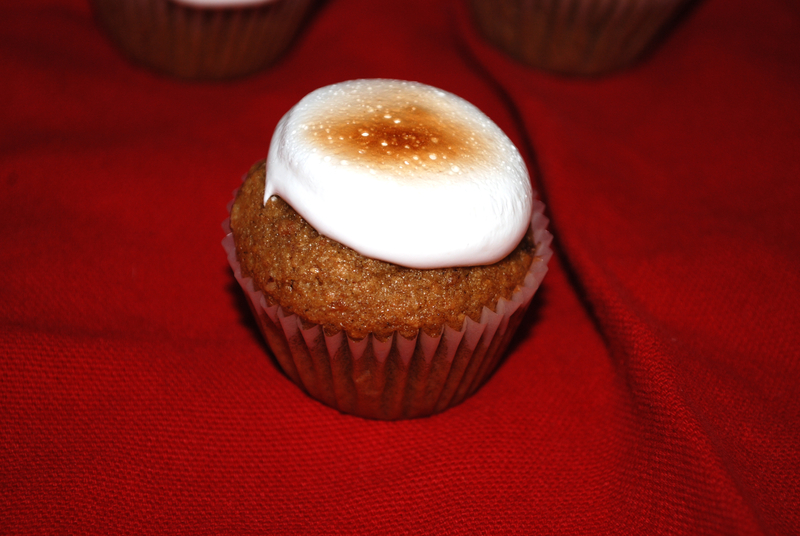 The most important elements to me were the brown sugar, marshmallow, and of course, the yams. I started with a sweet potato cake recipe that I found at Epicurious and adapted it only slightly. roughly 1 cup of toasted chopped pecans. Preheat the oven to 350 degrees and fill one pan of mini muffin tins with liners. In a medium bowl, combine the flour, leaveners and salt. 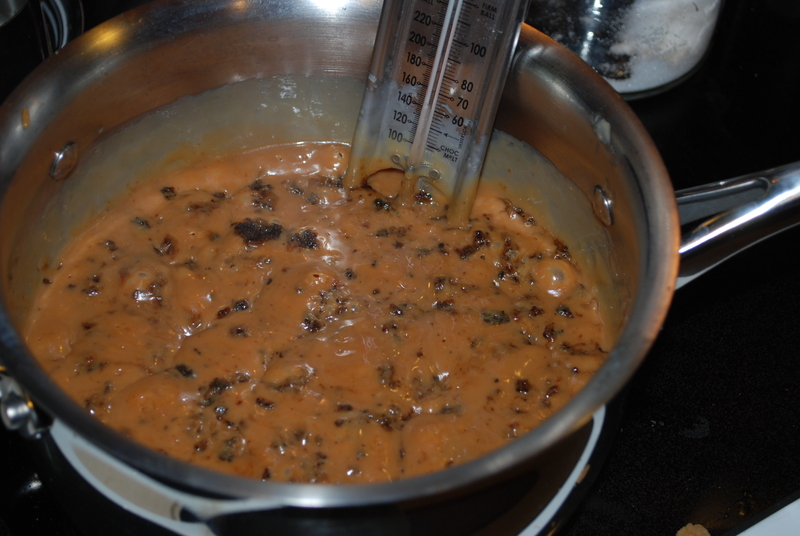 In a larger mixer bowl, combine the yams with sugar and oil and beat until smooth. Add the eggs one at a time, mixing well after each addition, then add the vanilla. Add half of the dry mixture and mix just until combined, then add the other half. Fold in the pecans. Scoop into prepared pans using a 1/2 ounce scoop. Bake for approximately 14 minutes. 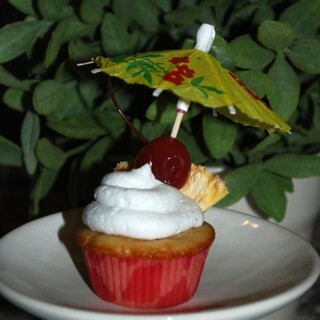 Yields 72 mini cupcakes. When I have multiple pans to bake, I fill one pan, then put it into the middle of the oven. I set the timer for 1/2 of the recommended time and let the first pan bake while I fill the second pan. I rotate the first pan over to the side of the oven and put the second pan in. I let both pans bake for the other 1/2 of the recommended time, then take out the first pan, moving the second pan into the center of the oven. I had to let the pans cool so the 3rd pan baked by itself. 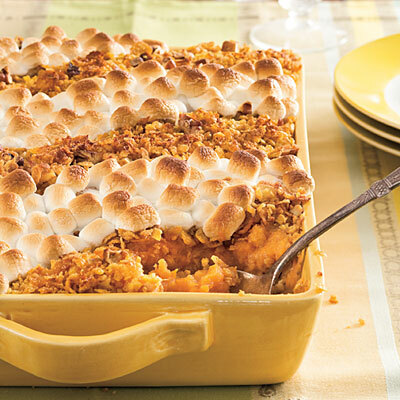 Sweet potato casserole normally has mini marshmallows baked on top, but marshmallows are not vegetarian since they contain gelatin. Instead I was going to make a Swiss meringue, which tastes essentially like a marshmallow, but then I read on someones baking blog (can’t find it now!) that she likes to use straight marshmallow fluff as an icing. I took this easy way out. I wouldn’t do it again…. I hoped that toasting the Fluff might stabilize it a bit… I was right. I should have had them ready to go under the broiler as soon as I piped on the Fluff. A pastry torch would have been better, but mine doesn’t work! It only takes 30-45 seconds to brown the tops nicely. While these cakes were a mess, I think they turned out tasty otherwise. If I were to do it over, I’d try the 7 minute frosting recipe I found on the Fluff website. I started off by making a banana cake using my standard cake but substituting pureed banana for some liquid. After the banana mixture is combined, gradually fold in the flour mixture. Pour into 2 greased round cake pans or a 13 x 9 inch greased rectangular pan. Bake at 350 degrees for 25 minutes or until done. Allow cake to cool in pan for 10-15 minutes, then remove. I used a Springform pan, so removing the cake from the pan was really easy. 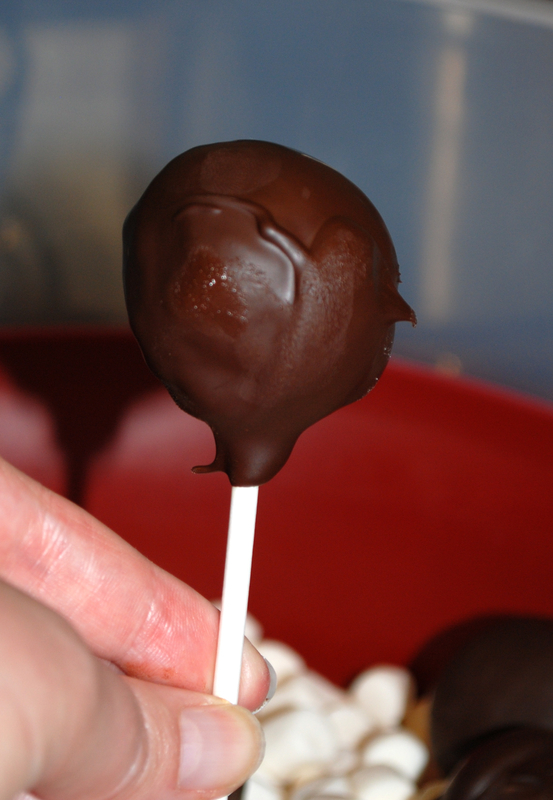 One of the advantages to making cake pops is that it doesn’t matter what condition the cake is in when it comes out of the pan! I dumped the cake into a huge bowl, then chopped it up a bit with a spatula and allowed it to cool completely. While the cake was cooling, I made a cream cheese frosting. The recipe I normally use calls for 1 stick of butter, 2 blocks of cream cheese (16 ounces total) and 1 and 1/2 cups powdered sugar. I had a tub of mascarpone cheese left over from Waldorf Salad, so I used this for half of the cream cheese. 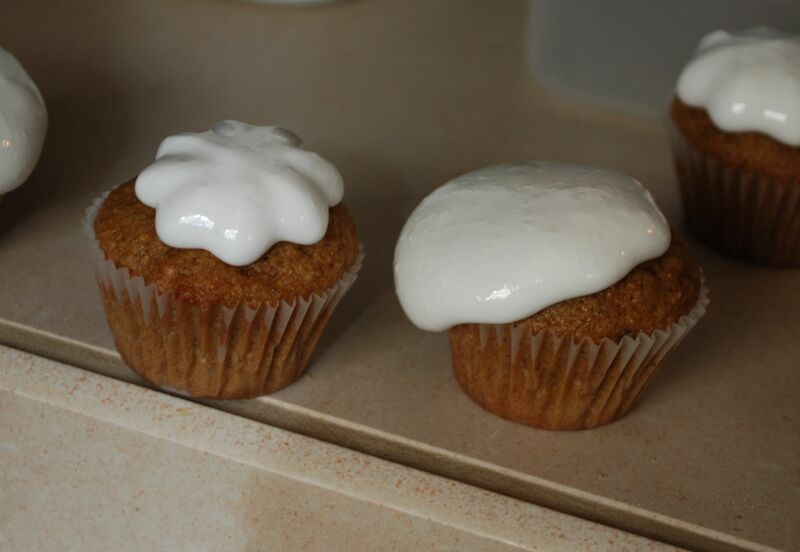 To make the icing, I allowed the ingredients to warm to room temperature, then creamed the butter until smooth. I added the cream cheese and beat it until smooth, then added the sugar a little at a time. After the cake was completely cooled, I dumped in about half of the icing and mixed well with my hands. I added more icing a little at a time until the mixture was moist enough to hold it’s shape in a ball without being overly wet. I had about 1/4 of the frosting left over, which I popped into the freezer to use later on. 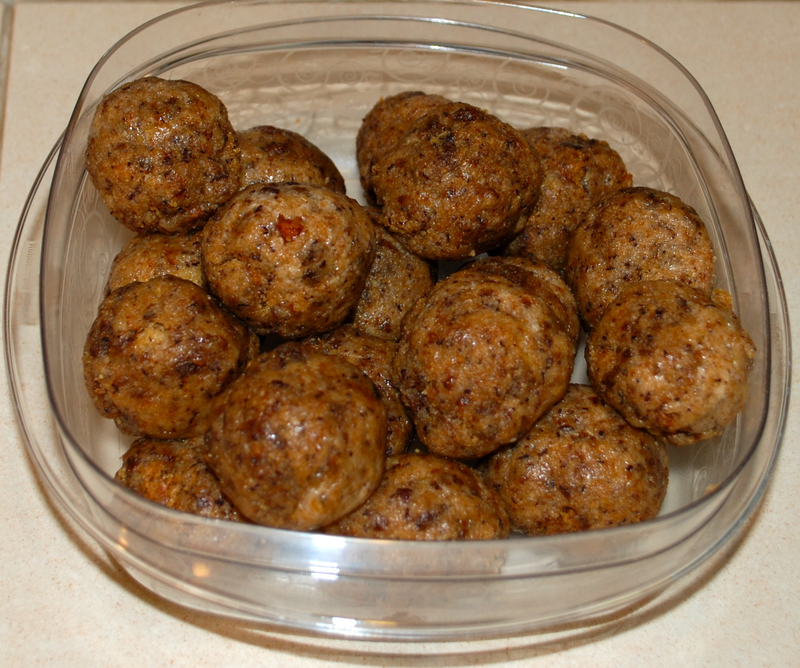 I molded the mixture into balls about 1 and 1/2 inches in diameter and added a stick. 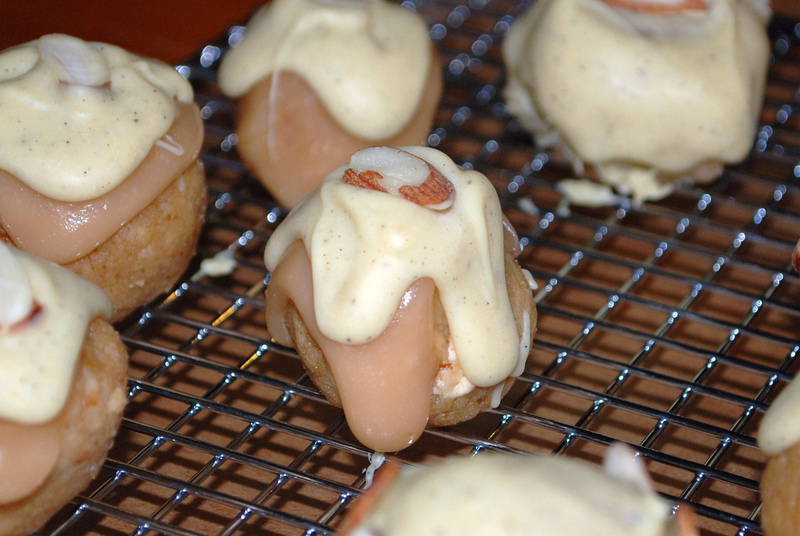 I placed them on a cookie sheet lined with parchment and let them sit in the freezer until solid. After solid, I put them into a zip lock until I had the chance a few days later to coat them in chocolate. My freezer is pretty small, so I had to do this in a couple of batches. I let the remaining balls rest in the refrigerator. 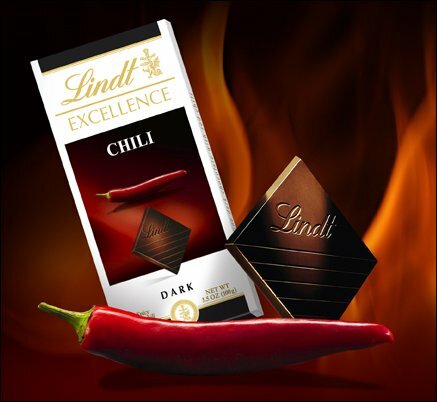 I melted the chocolate together in a metal bowl set over simmering water and used one square of the chili bar to each square of Dove chocolate. When it was smooth, I spooned it over the frozen pops. I leaned the sticks into a cooling rack set over parchment paper to let them drain and harden. I thought these turned out really tasty. The interior was moist enough to stick together without being overly wet. There was a little crunch from the toasted pecans. The cake and icing were a nice compliment to the dark chocolate and the chili added just enough heat to make the back of my throat tingle. My dog walker stated that these are her favorite so far. Finding a food that starts with X was very difficult. 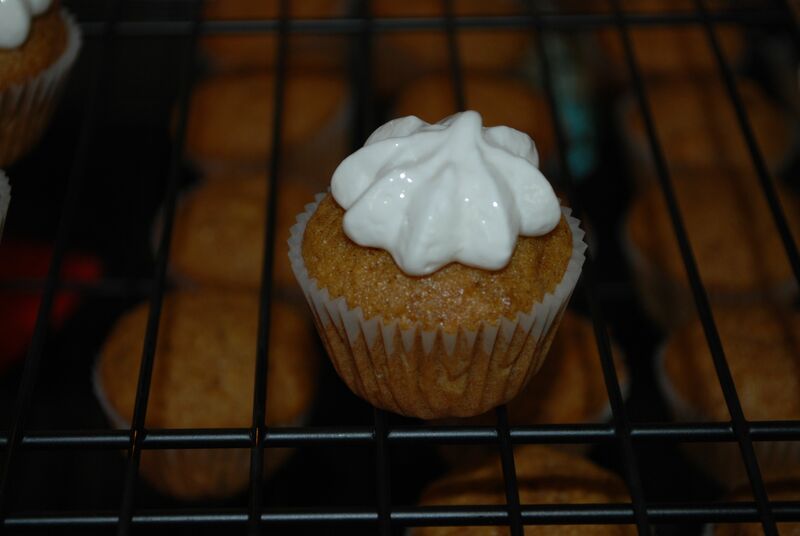 There is Xanthan Gum…useful for gluten free cupcakes, but definitely not a main ingredient. Xavier Steak: which has asparagus and Swiss cheese. Those two might be an interesting cupcake combination, but adding meat is a bit…gross? X-treme AirHeads, also gross, but for a different reason. I gave up on finding anything English starting with X and went global. While researching for this post (after baking), I discovered an Indian curry called Xacuti which would have been very interesting. It contains white poppy seeds, coconut, chilies and various other curry spices. There are a multitude of Chinese (Mandarin, I think) foods that start with X: xia (shrimp), xiang chang (a sausage), xiang fun (a mushroom), xian rou (bacon), xiaodianxin (cookies). Xiang cao jing is vanilla, but that’s kind of boring. Xigua, I just discovered, is watermelon. I’ve seen unsuccessful results on Cupcake Wars with watermelon. I finally decided on Xiang Jiao (banana). Banana is a little boring, but I hoped that I could do something to spice it up a bit. While in Portland one day, we stopped in a chocolate store and I saw a chocolate bar by Xocolatl de David. After a little googling, I discovered that Xocolatl is the Aztec word for chocolate. Chocolate and banana are a great combination. Xocolatl Xiang Jiao cake pops!